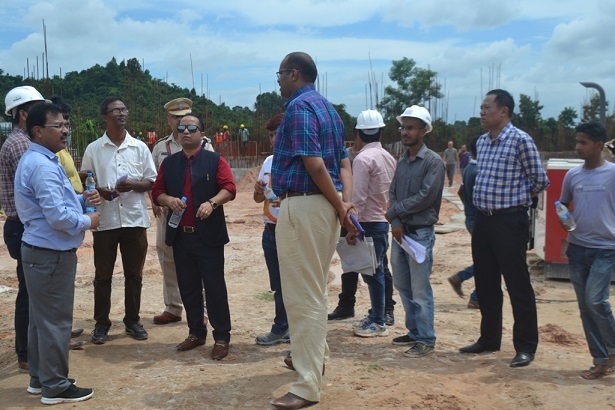 Meghalaya sports and youth affairs minister Banteidor Lyngdoh on Thursday inspected the ongoing construction of International Multi-Sports Stadium and Football Stadium at Ampati in South West Garo Hills and a cold storage facility at Garobadha. The minister visited Ampati to review the progress of the project as the state would host the National Games in 2022. Reviewing the project, the Lyngdoh stressed the need to complete the sports infrastructure within the stipulated time of three years. The project cost was estimated at Rs 46 crore. The site located at Bolsalgre on the outskirts of Ampati with an area of 16 acres which was sanctioned under NLCPR. The minister also interacted with members of the families of Bolsalgre-Bandoraja A·king who had donated their land for the purpose. South West Garo Hills district deputy commissioner Ramkumar S, director of sports and youth affairs Matsiewdor War Nongbri, district police chief B S W Momin, assistant director sports, J P Marak, and other district officials besides Subhash Jhunjhunwala director of JC Infra Corporation Ltd, the company which is executing the project accompanied the minister. Lyngdoh, who also holds the agriculture and horticulture portfolios, visited the cold storage facility at Garobadha, which has been lying non-functional for a long time and looked at all possibilities to revive the facility for the benefit of the farmers. The cold storage facility was managed by the district agriculture and marketing cooperative society. Agriculture and horticulture officials accompanied Lyngdoh during the inspection and discussed the possibility of shifting the congested Garobadha market to an area near the cold storage facility.